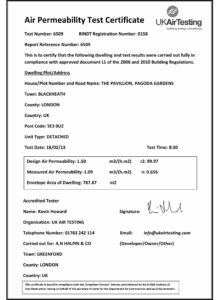 The Pavilion has surpassed expectation by achieving an incredible air-pressure test result of 1.09 (h.m2), which is comparable to the German Passivhaus standard. The Pavilion has surpassed expectation by achieving an incredible air-pressure test result of 1.09 (h.m2), which is comparable to the German Passivhaus standard. The air tightness (or permeability) is a key factor in achieving a highly sustainable, low-energy home. The purpose of creating an airtight home is to regulate all air entering and leaving the building. Unregulated ventilation, such as that occurring from poorly fitted windows, cable penetrations and even cracks between building elements, allow warm air to escape and cold air to enter leading to an increased heating demand. On The Pavilion we took things a step further and removed all mechanical extracts, open flues and vents from the design and replaced them with a Mechanical Ventilation and Heat Recovery (MVHR) system. The MVHR will regulate air entering and leaving the home, and crucially, preheat the incoming cold air using energy extracted from the stale exhaust air. These systems are at their most efficient when installed in an airtight building. Throughout the design process we were focused on establishing a method of achieving such low levels of air permeability and ensuring this was considered for all junctions in the building elements. This coupled with highly skilled workforce on site has achieved a result beyond our expectations, and on the first test too! The use of solid construction techniques with lime-plaster has helped to realise this and should also contribute to low-energy demands and a healthy internal environment through the inherent thermal properties and breathability of the materials.